TORONTO -- The chief executives of Canada's biggest banks say they expect muted economic growth, a slower spring housing market and have concerns about the country's future prosperity, but also expressed confidence in their ability to navigate any rough patches ahead. Toronto-Dominion Bank's CEO Bharat Masrani said the lender's economists foresee "constrained" growth in 2019, amid trade tensions and strains in the energy market, but Canada is benefiting from U.S. strength and the bank will be able to adapt to any environment. When asked about whether he saw a recession looming in Canada, Masrani responded that any of the current headwinds become "profound" in some manner, then, "of course." "Any of these factors in combination can cause a slowdown, and that's the risk in the system," he told reporters after TD's annual general meeting of shareholders in Toronto. "And you're seeing it play out in sentiment, and you can see it in some of the numbers." However, he noted, "we are a developed economy... And we'll adapt to this reality. Whatever that is." The commentary from TD, as well as the Canadian Imperial Bank of Commerce and Royal Bank of Canada -- all of which held their annual shareholders meetings on Thursday -- comes after analysts and shortsellers raised red flags about the country's economy and its banking sector. Veritas analysts Nigel D'Souza recently cautioned that Canada's banking sector was likely facing an "inflection point" in the credit cycle and investors should reduce exposure ahead of an "acceleration of credit losses." As well, Steve Eisman, a portfolio manager at Neuberger Berman in New York featured in the film The Big Short, recently reiterated his bet against the Canadian banks. He pointed towards the real estate sector and noted that Canada hasn't had a credit cycle in roughly three decades. Earlier this week, Bank of Montreal CEO Darryl White said the risk of a recession in the coming year was "relatively low." 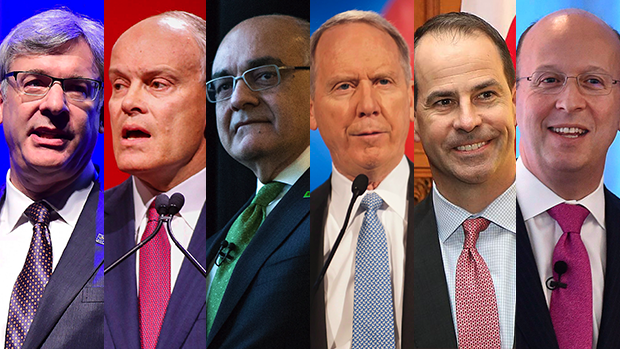 On Thursday, CIBC's chief executive Victor Dodig told its shareholders meeting in Montreal that amid growing commentary about being late in the credit cycle, Canada and the bank are both "very well positioned" for the cycle's end. Dodig added in an interview that CIBC economists' prediction of 1.6 per cent GDP growth in 2019 is a "decent level of growth -- it's only a bit softer than it was last year." "The Canadian banking sector is much more resilient than people realize," he said. "I think we have macroprudential regulation that has always proven to be sound and without populism. And those are important factors." TD is expecting mortgage growth to "moderate, somewhat" with growth in the mid-single digits, said Masrani. The sentiment among consumers at this stage is "nervousness," he added. "If the job market continues to be steady and strong, I think this particular nervousness shall pass," he told reporters. "But we are in the late stage of the cycle, and people are right to worry about it as they are." Dodig said he expects a "more muted" mortgage market than you've seen in the past." "People are adjusting, they're buying homes that fit their budget, based on these new regulations," he said. "I don't think you're going to see any markets on fire... You'll see a relatively benign market." Royal Bank of Canada's chief executive Dave McKay, meanwhile, at the lender's annual meeting Thursday focused on longer-term economic prospects, noting that Canada is at a "critical time" in its history. "Our competitiveness is challenged. Our capacity to grow and advance the economy is stalling," he said during his speech in Halifax. McKay called for a "new approach" and urged, among other things, investment in energy infrastructure such as pipelines to ensure Canada remains prosperous for now, and "generations to come." He added that the need to reduce the country's carbon footprint must be balanced with the need to produce more energy to supply growing demand globally. "We're putting our standard of living at risk if we don't strike this balance," McKay said. "Canada's lost $100 billion in energy projects in the last two years alone. We simply can't afford to lose any more."